After a good night’s sleep we woke up to blue skies and sunshine again, hurrah. The weather forecast was for rain late morning here in Schongau and rain from 5pm in Königsbrunn, our destination for today. If we were lucky we could dodge the rain as we travel. Breakfast was once again very good, with scrambled egg and really nice bacon available. 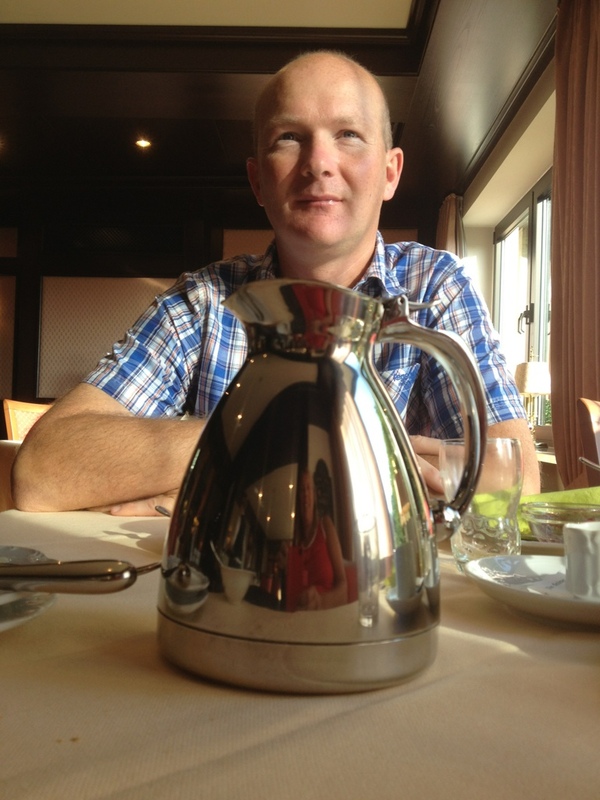 Here is a photograph of both of us at the breakfast table. We paid our bill and then fetched the bikes out of the wine cellar. The forecast today was for rain late morning in Schongau but we could see blue skies and the sun was pretty warm, even at 10am. We headed off down the hill, realising almost immediately that the Garmin-plotted route involved us walking up a huge flight of steps. No thanks! We turned round and did a road route instead, although it was really hard work cycling up a very steep hill just after breakfast and with no warm up! 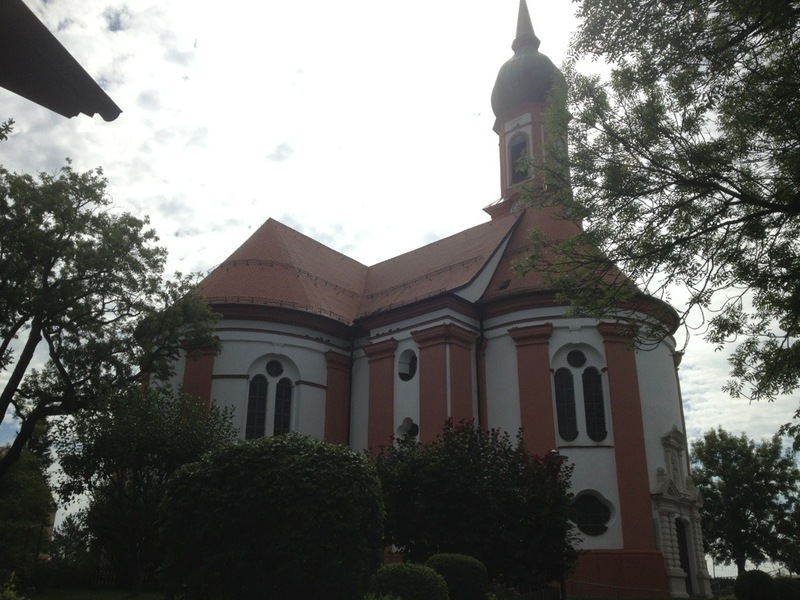 However, once we got up the hill we set off on our way northwards, passing through Altenstadt. The view before us was much flatter than of late. 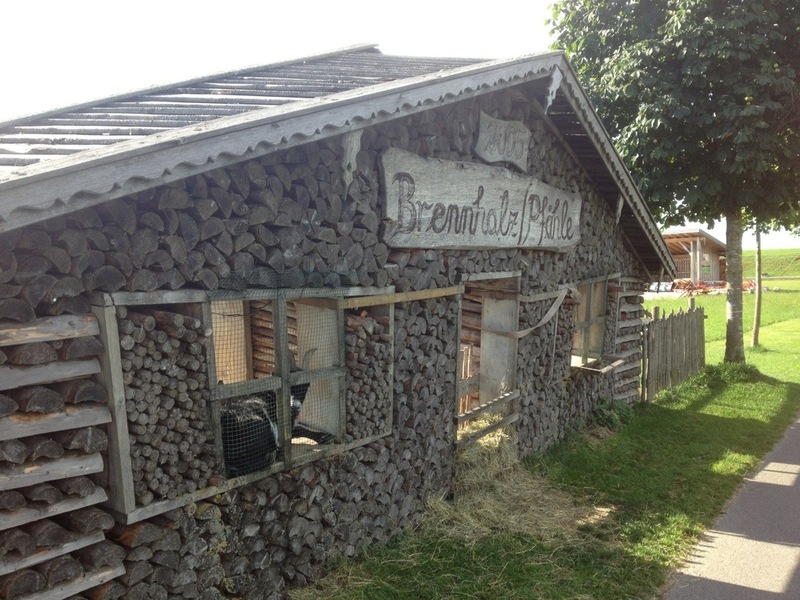 We arrived at Schwabniederhofen and I noticed something unusual as I zoomed past a log store. Firstly it had been made into the shape of a house, although it was just a series of logs. Secondly it was leaning rather towards the road. Thirdly there were two goats sitting on the windowsill of the house. I kid you not! We had a brief section of unmade road (compacted crushed stone) but it wasn’t too bad compared with yesterday’s very difficult road surface at times. This only lasted about 1km so it wasn’t too bad. 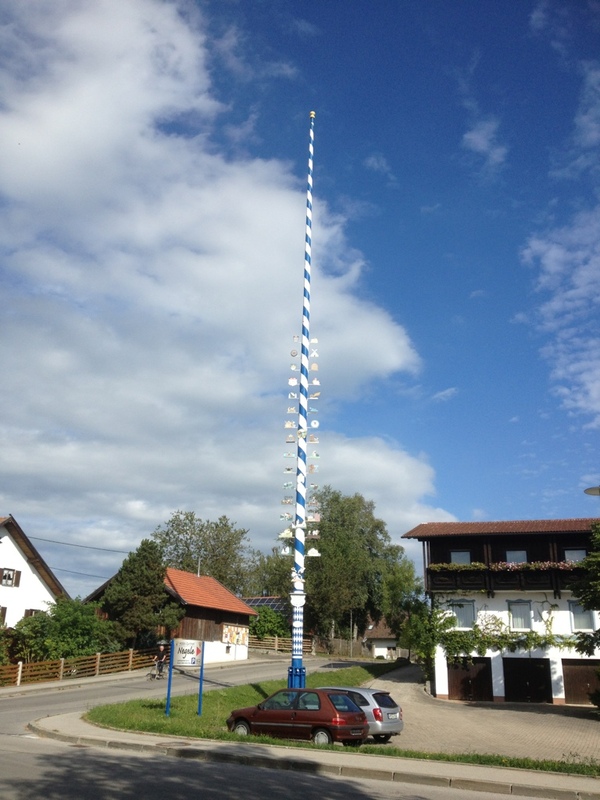 And thirdly they had a huge pole with the Bavarian colours and lots of images on it, presumably of the trades in the village. 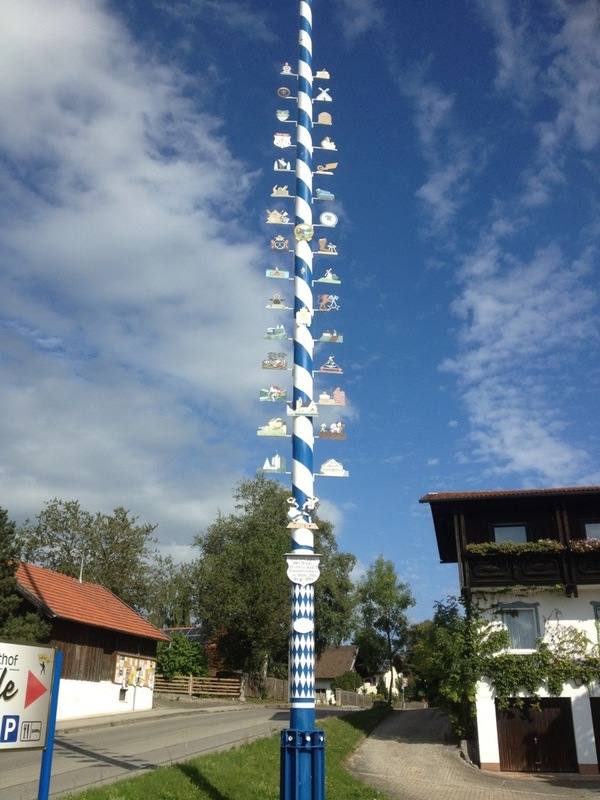 Here is a close-up of the pole, we recognised a beehive, chicken, windmill, boot and shoemaker, delivery company, pretzel maker (bakery?) and more. 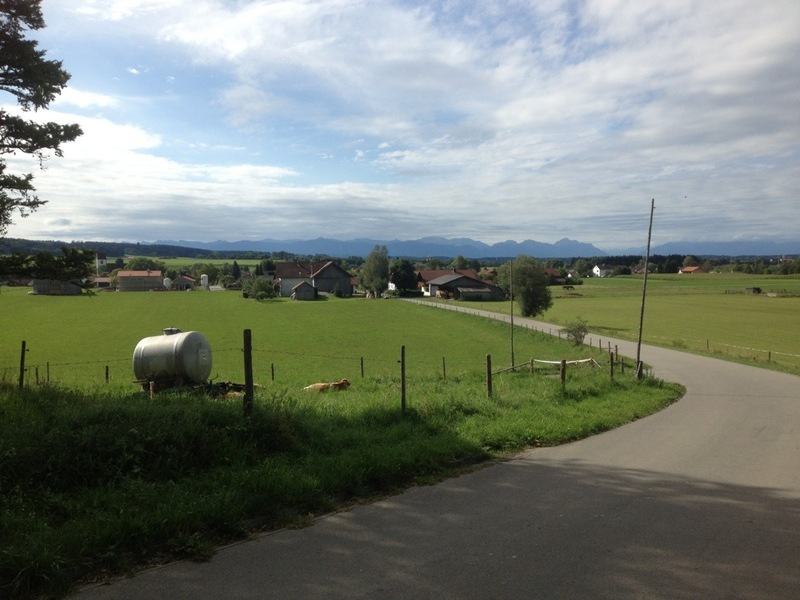 There was a bit of a climb up out of Hohenfurch and then we were on a wide, flat plain with pretty good views back towards the Alps. It felt as if we had a tailwind (although it was supposed to be a northerly today) and we zoomed along the excellent cycle path, enjoying the speed. We saw some other cyclists, including lots with big panniers who were presumably also doing the Romantische Straße, but were mostly on our own. 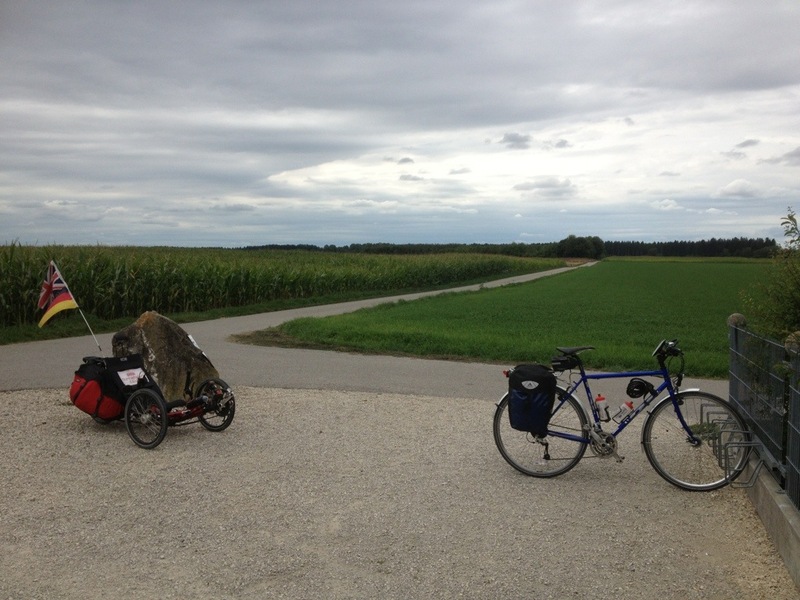 We rode through Kinsau and could see from our map that the Lech river, which we first met as a small stream in Füssen, was getting a lot wider here. It was also a long way below us, as wee realised when we got a glimpse of it past Kinsau. What became clear was that the river had cut quite a steep gorge at this point in its travels. We discovered this when it was time to cross the river at Epfach – we had a fantastic, swoopy descent which was great fun. But then crossed the bridge and had the most horrendous, long and steep climb on a road with no cycle path. However, the view from the top made it almost worth the effort. Almost! 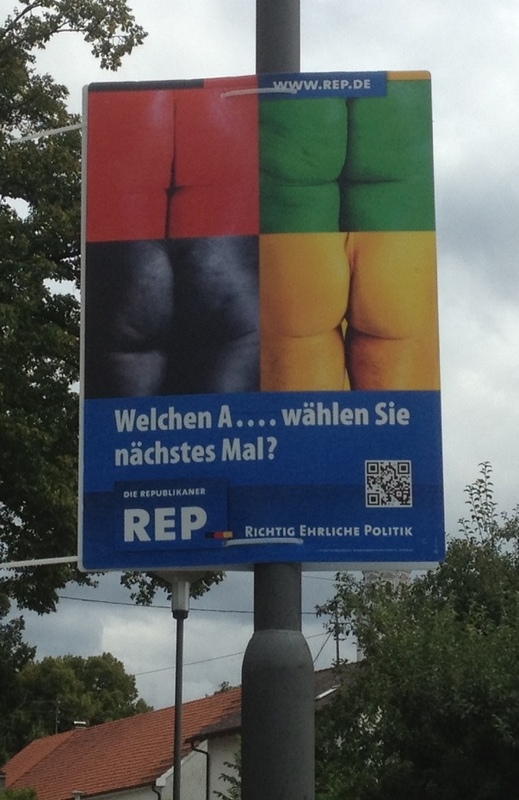 This is an example of one of the many election posters we’ve been seeing so far. Most are people’s faces, names, their party and their number on the ballot paper. 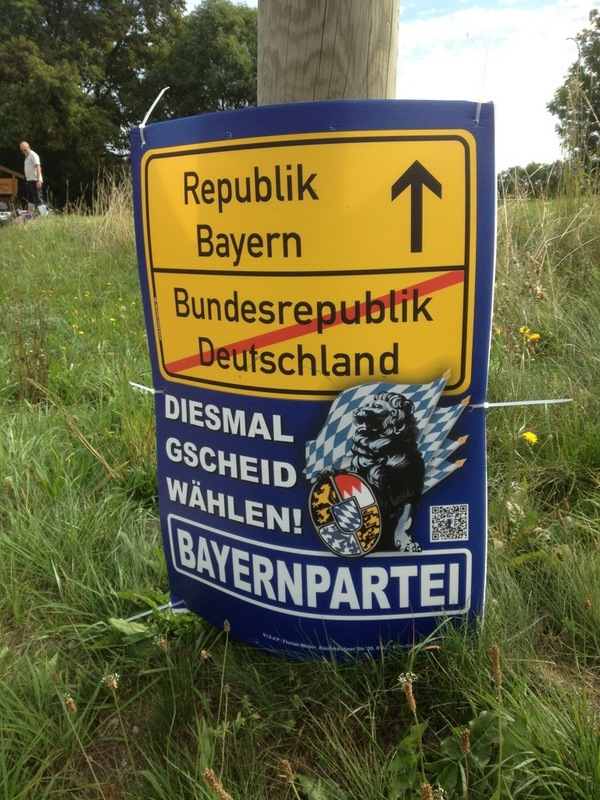 But this one is from a political party who want Bavaria to secede from Germany. I suspect they’ll be out of luck but they had a lot of support in the villages we went through today. Here is James waiting at the top. His bike appears to have collapsed! On we pootled, relieved to find we were now on a mostly flat section of the route with just a few gentle undulations. Our speed was picking up which was good as we had 42 miles to do today and the first fifteen had seemed to take rather a long time. This is partly because I kept stopping to take photos of things of course! 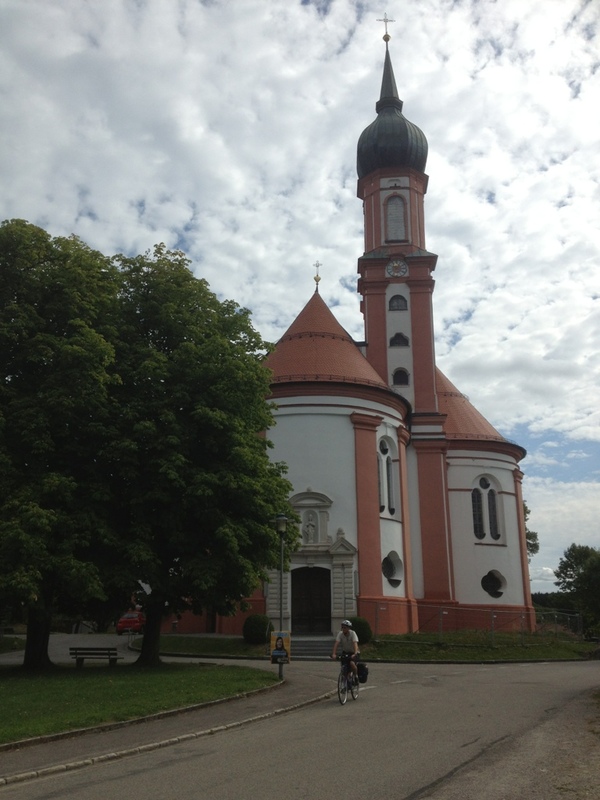 We arrived at Vilgertshofen which is a very small village notable mainly for its church, the Wallfahrtskirche Mariä Himmelfahrt (Pilgrimage Church of the Assumption). It was built between 1687 and 1692 by Johann Schmuzer… adopting a centralised Greek cross plan but the exterior has a slightly lopsided effect as only one of the two planned towers was built, and that belatedly. James and I had a good look at the church exterior but to be honest it didn’t look that weird to us! When cycle touring it’s often strange little things that catch my eye. I really liked the different woods on this barn door. 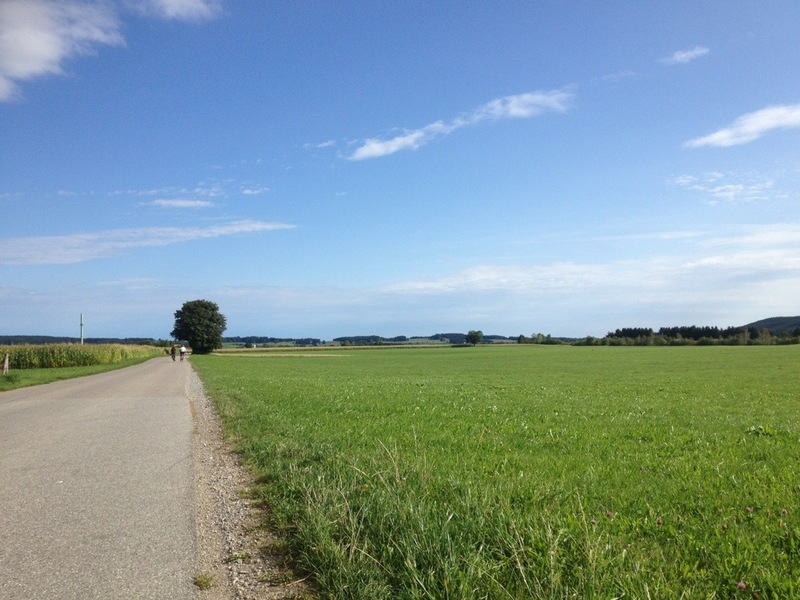 After Stadl we continued on to Stoffen, once again enjoying the lovely smooth road surface. 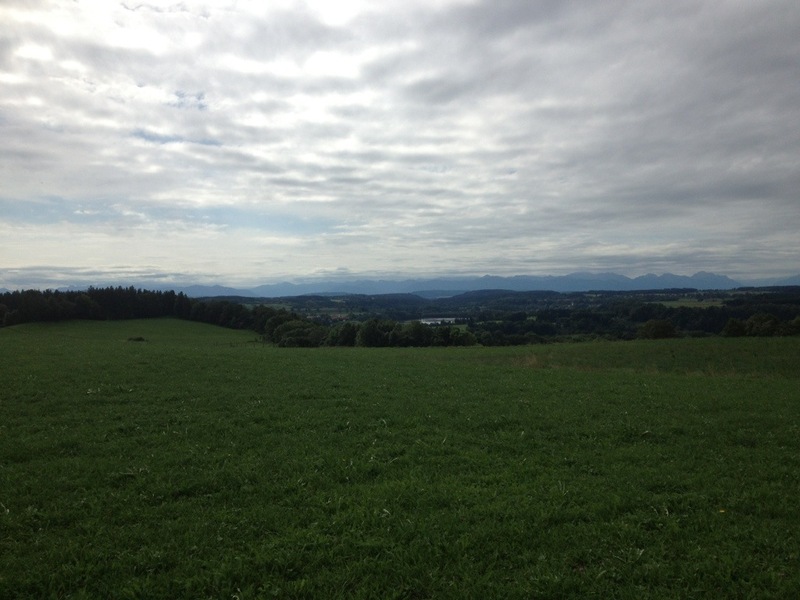 It was also notable that the view behind had some darker clouds amassing so the forecasted rain looked like it was indeed falling in Schongau. 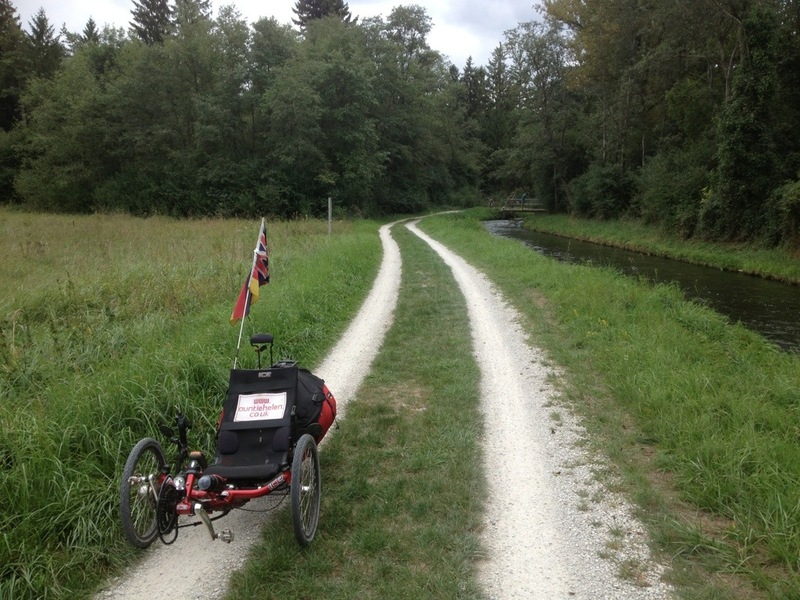 At Stoffen we headed westwards a little towards the Lech river, enjoying a super-speedy downhill into Pitzling where we joined a riverside cycle path made of compacted crushed stone. 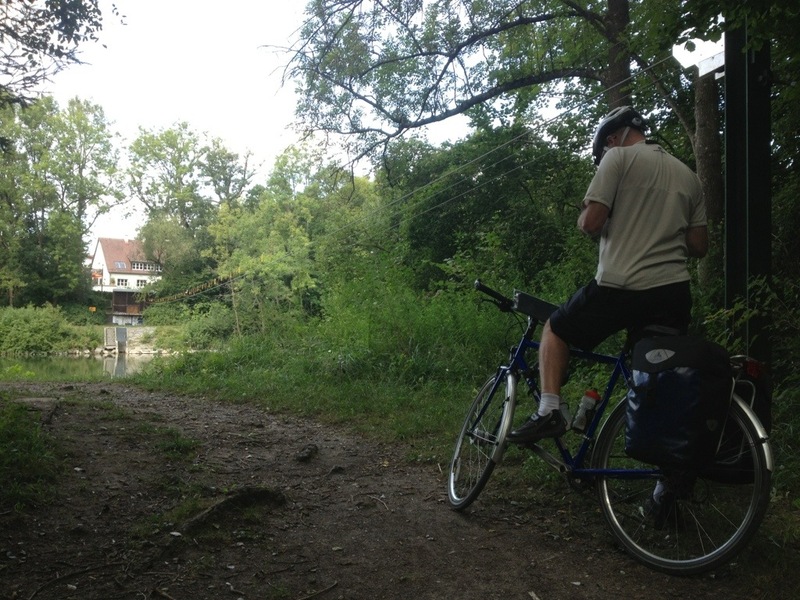 This was clearly a very popular route from Landsberg am Lech, about 4 kilometres along the riverside. There were lots of walkers and cyclists but everyone seemed to get along fine. Although this was a river it looked rather more like a lake a lot of the time as it was very still. 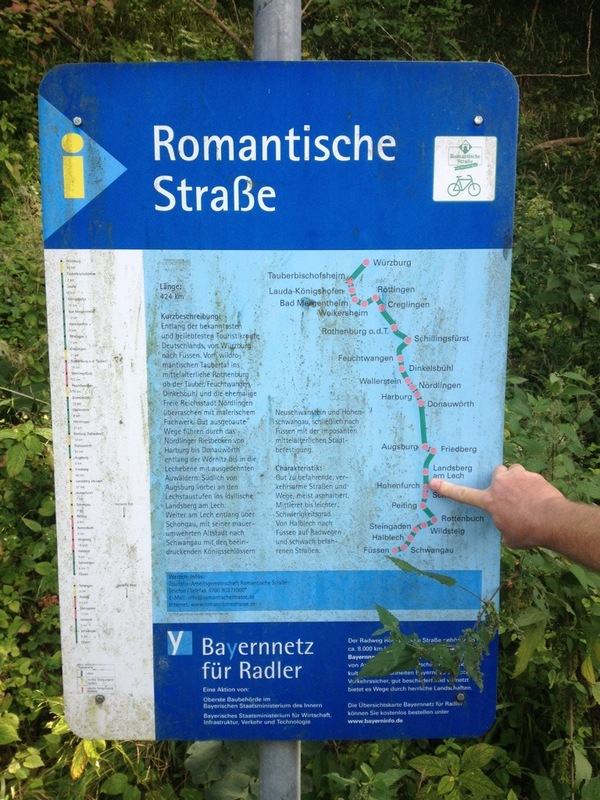 Here is a helpful plaque showing the Romantic Road route – James’s finger marks the point we had reached (we started at the bottom of course). 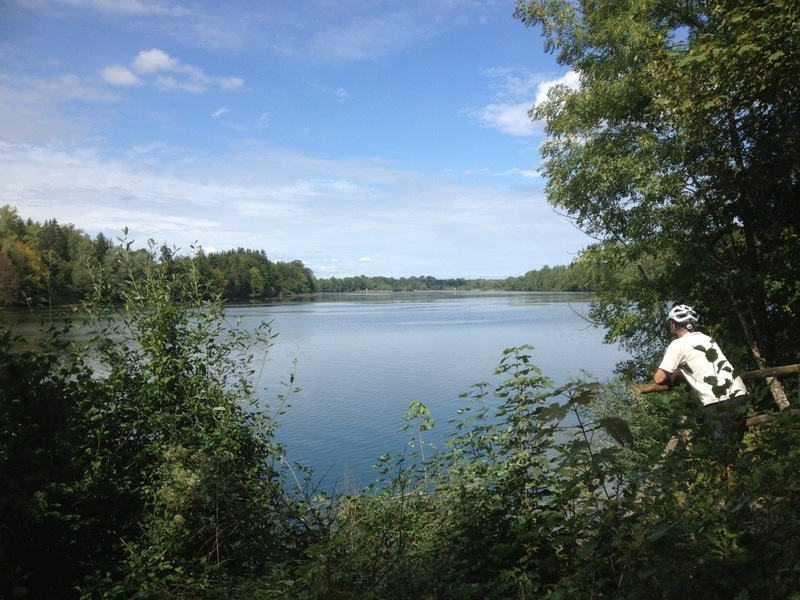 This was a really lovely part of today’s ride and we went fairly slowly, soaking up the scenery. 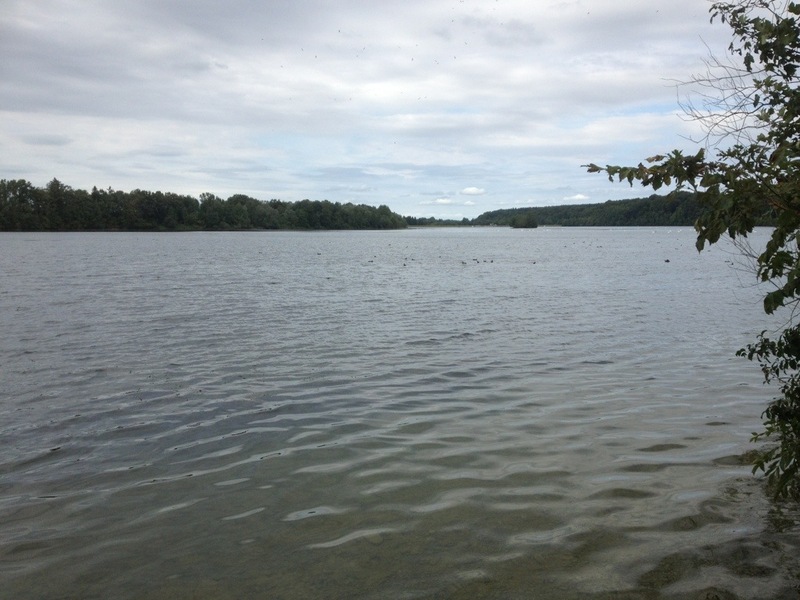 The reason for the still water became clear fairly soon – a hydroelectric plant. Another surprise a little further on – a cable system stretched across the river. There was one thick cable and then two thinner ones below (a pulley system?) but we couldn’t work out what this was for. There was no sign of a ferry/landing stage. 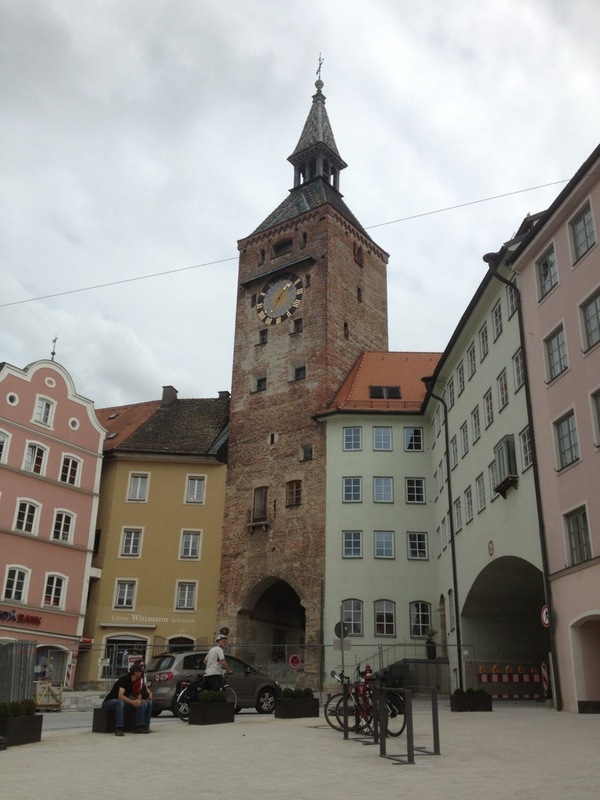 We arrived at Landsberg am Lech, one of the larger towns on this trip, and a wonderfully historic place with very impressive town walls, lots of tall towers and attractive old buildings. First things first though – cake! 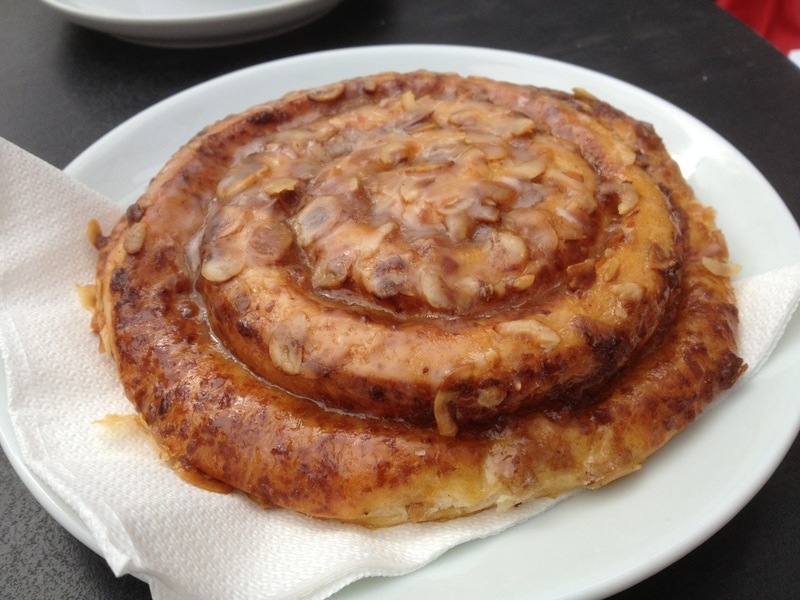 Unfortunately for James he had chosen a pastry that wasps seem to really like and he had three helping him eat it. In the end we sat inside the café (we had started off outside) and only one bothered to come in to help James with his pastry. We survived unstung. 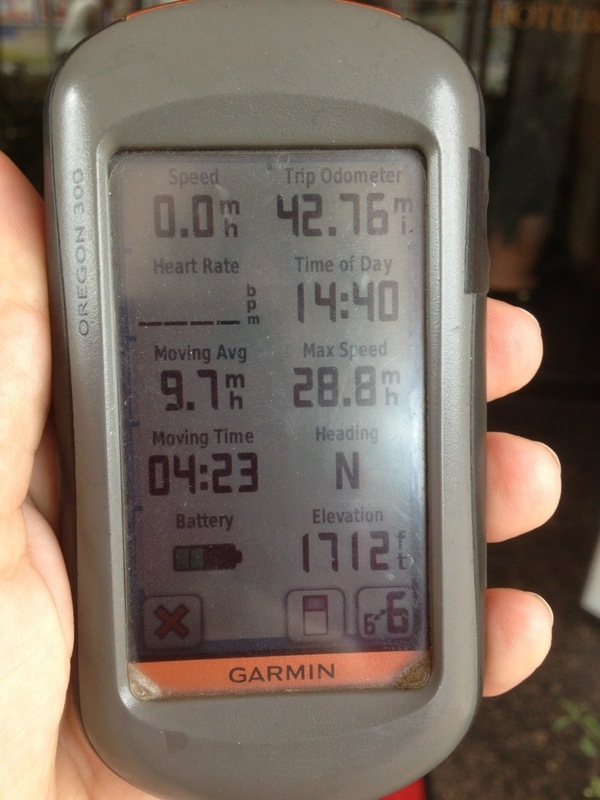 We didn’t hang around too long as we still had twenty miles to ride and wanted to get going. A quick ride along the high street showed us some interesting buildings but it was a shame cars were still allowed through. They were also relaying the cobbles so it looked a bit like a building site in places. Unfortunately the roadworks obscured this building a little, the Rathaus. 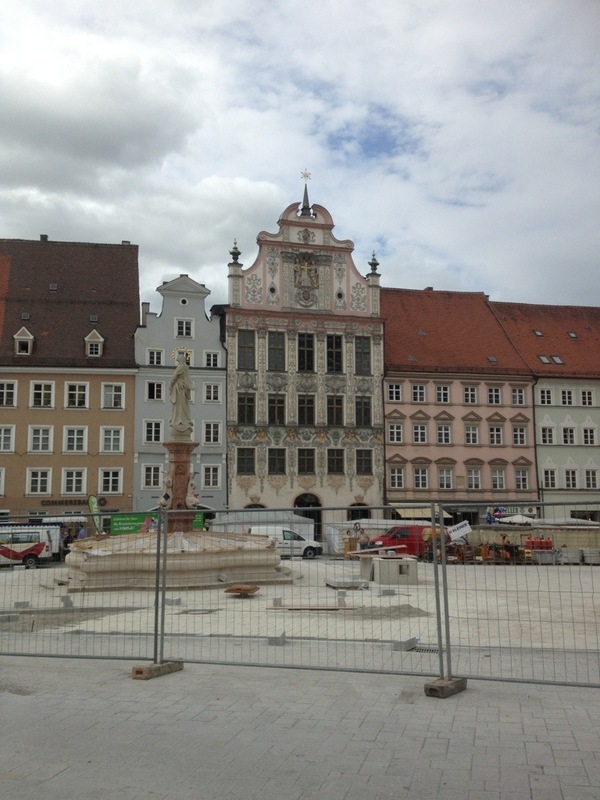 Unusually the Rathaus (Town Hall) is sandwiched among a row of mansions on the northern side of the square. It was built between 1699 and 1702 but the exuberant stuccowork facade, Dominikus Zimmermann’s only major secular commission, was not added until 1719. Dominikus Zimmermann was the architect of the amazing rococco Wieskirche we saw yesterday, and lots of other local buildings too. 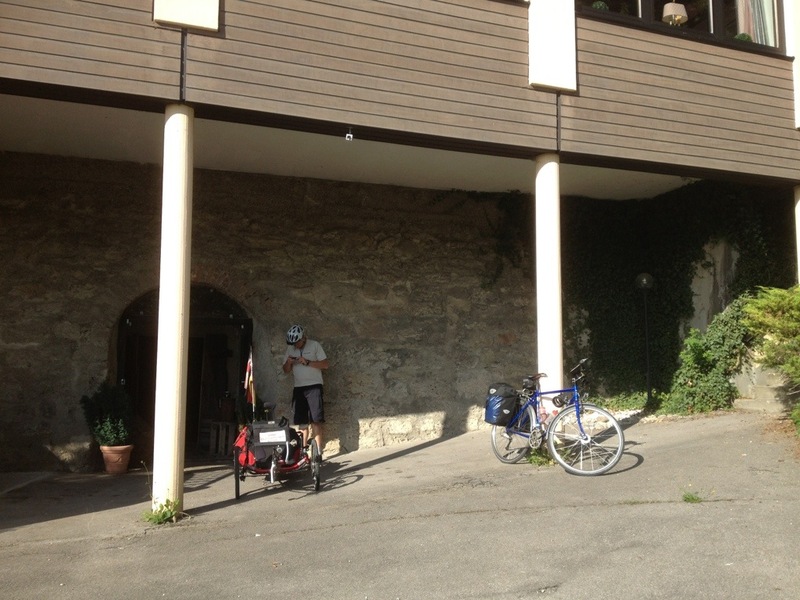 Here is James cycling towards the Schmalzturm (‘Lard Tower’), named this because lard used to be traded in its passageway, apparently! Our route out took us past the very tall indeed Jungfernsprungturm which was too obscured by trees to get a picture when we were able to stop. 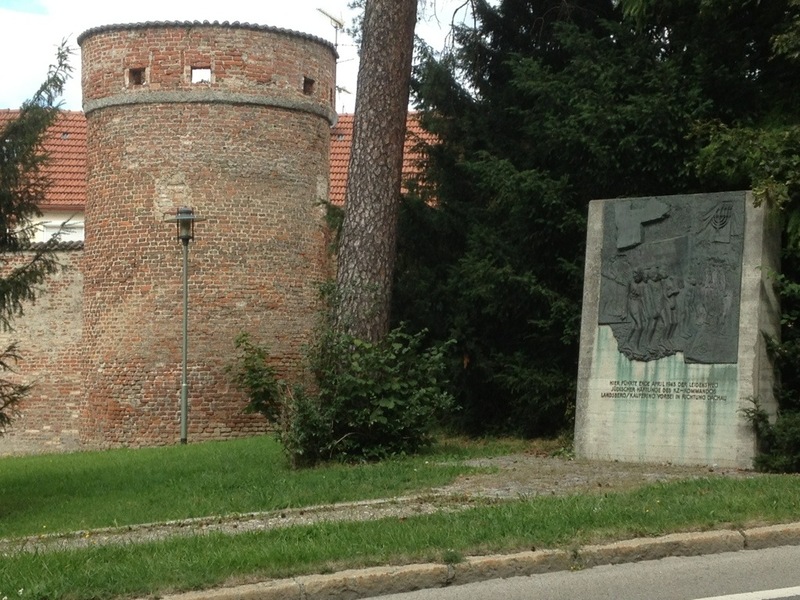 There were also lots of towers and walls, including this tower which had a Jewish memorial beside it, remembering the Jews from this region who were sent to Dachau. 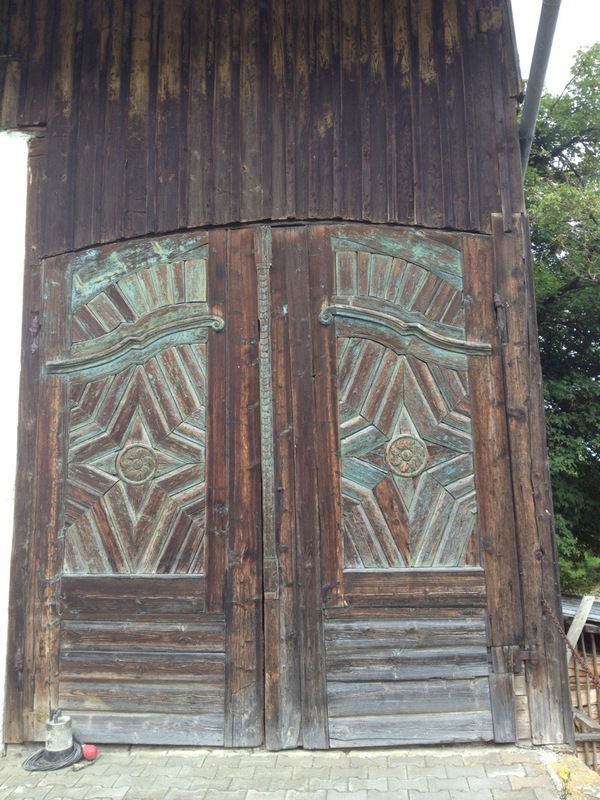 the most imposing mediaeval gateway in southern Germany and nowadays the symbol of Landsberg. Completed in 1425 as the crowning glory of a complete revamping of the municipal fortifications, it stands at an elevation 40m above that of the lower town. An outer barbican guards a 36m high tower, whose outer face is adorned with a monumental carved scene of the Crucifixion. 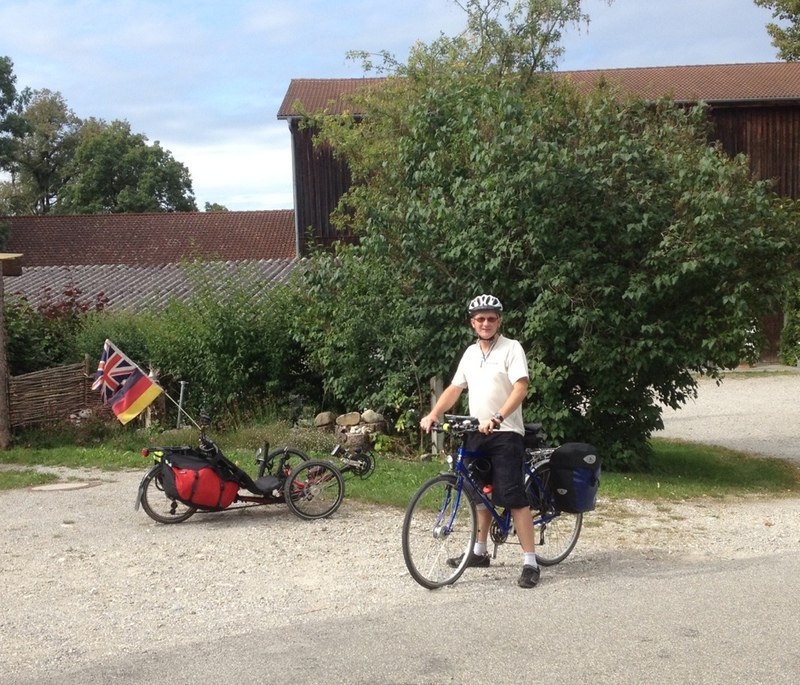 As we were heading out of Landsberg we received an SMS from friend Melanie who lives fairly near to our route – she and her partner Konrad would be able to meet us in Meitingen tomorrow evening for dinner. That was great news – it would be lovely to see them again! 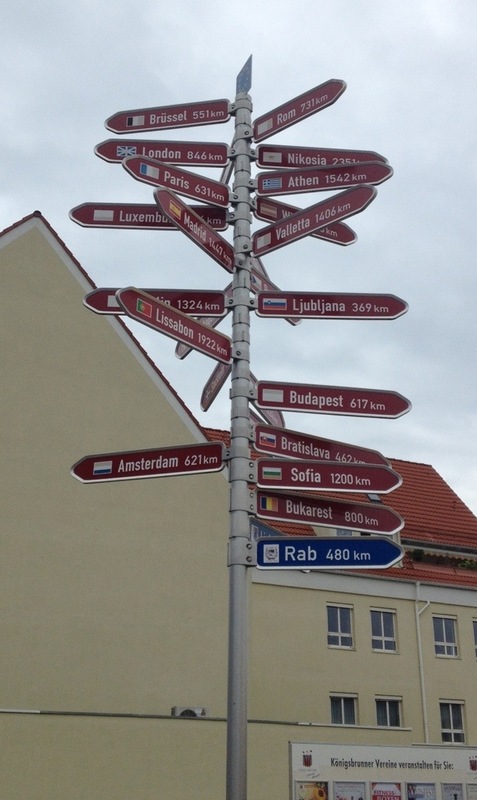 As we left Landsberg we saw this series of signs welcoming you to the town. I have never heard of ‘Failsworth’ in the UK but it turns out it’s between Oldham and Manchester. Here’s another political sign, you can probably work out what it’s on about. 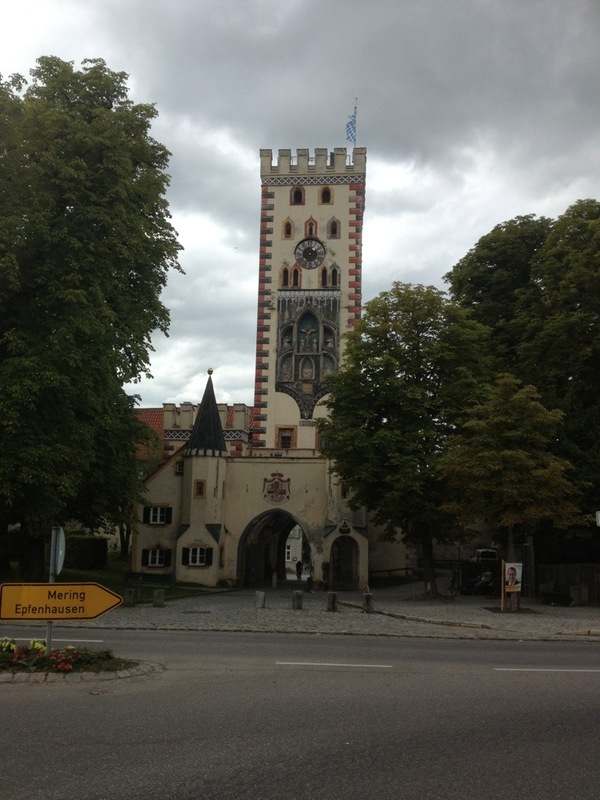 From Landsberg we headed north on very quiet asphalt roads towards Kaufering. When we reached Kaufering the track was supposed to become crushed stone again but it continued as tarmac for a couple of miles, it turns out because E-on had a hydroelectric plant here and had obviously improved the access road. 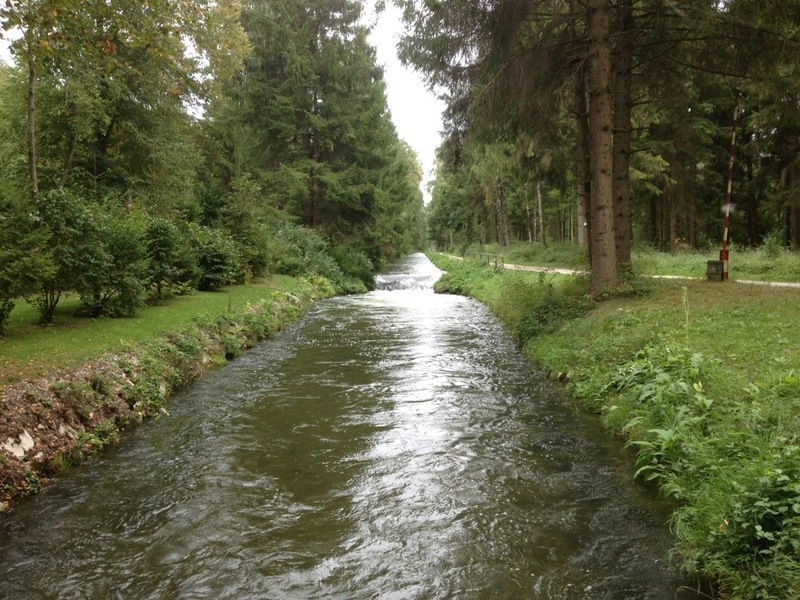 Once again it was alongside the river Lech. 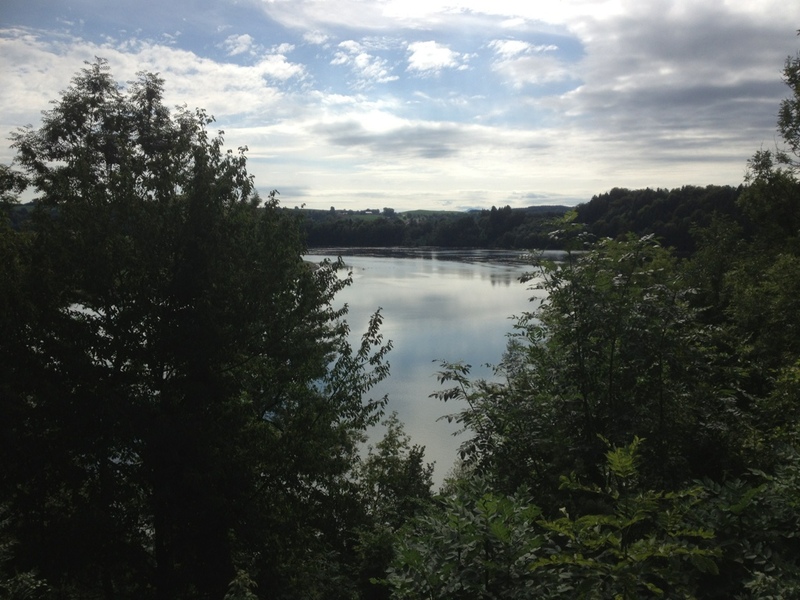 This is looking upstream from the hydroelectric plant – the water is beautifully still this side. There was a fair drop to the other side. Unfortunately after the hydroelectric plant the track reverted to crushed stone so we couldn’t go as fast but it was a reasonable quality of this kind of path so we were just slowed to about 10mph. We had been cruising at 14-15mph before this on the asphalt. Fortunately after three or so miles we joined a different section of path which was now asphalt. 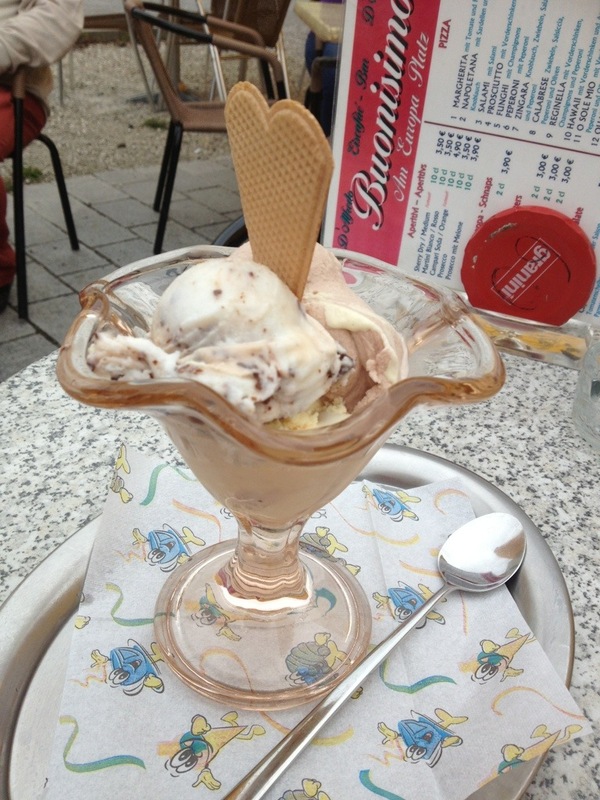 We reached the village of Scheuring where we thought we might stop for ice cream. 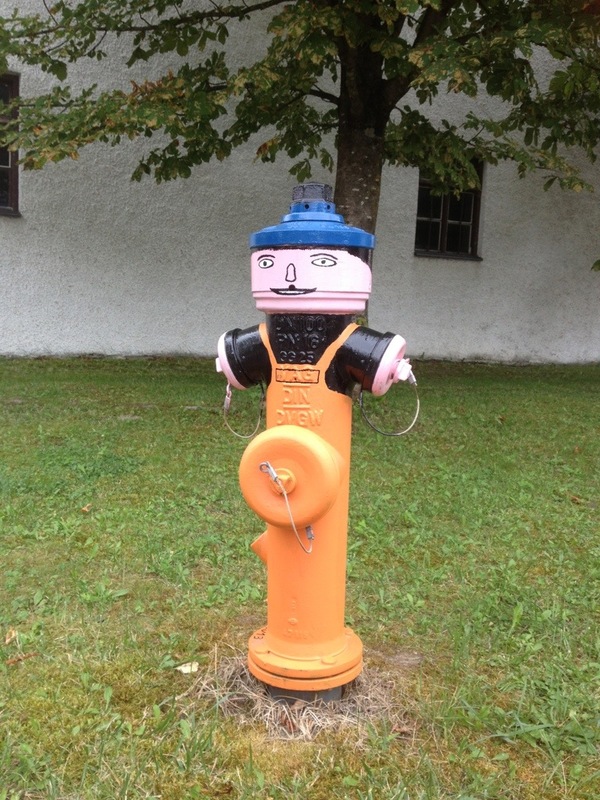 Unfortunately we didn’t see any open Eiscafés or other eating establishments, but we did see a couple of amusingly-painted fire hydrants. Here’s one. 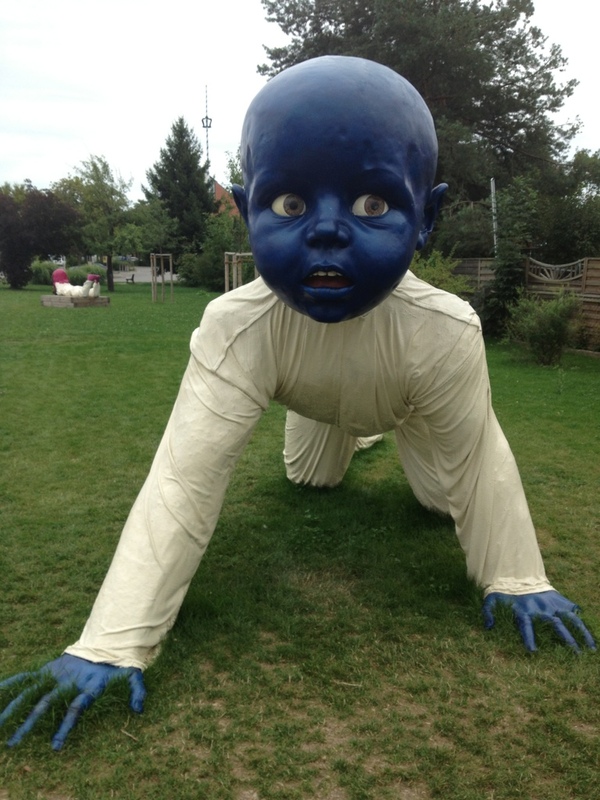 We saw another one painted as a man wearing a blue-and-white horizontally striped top. I was going too fast to photograph him though! We hoped that the next village, Pittriching, might provide us with some ice cream. We were going really fast now with heavy clouds behind us, hoping to outrun the rain. We did stop for five minutes at this rather lovely little chapel. 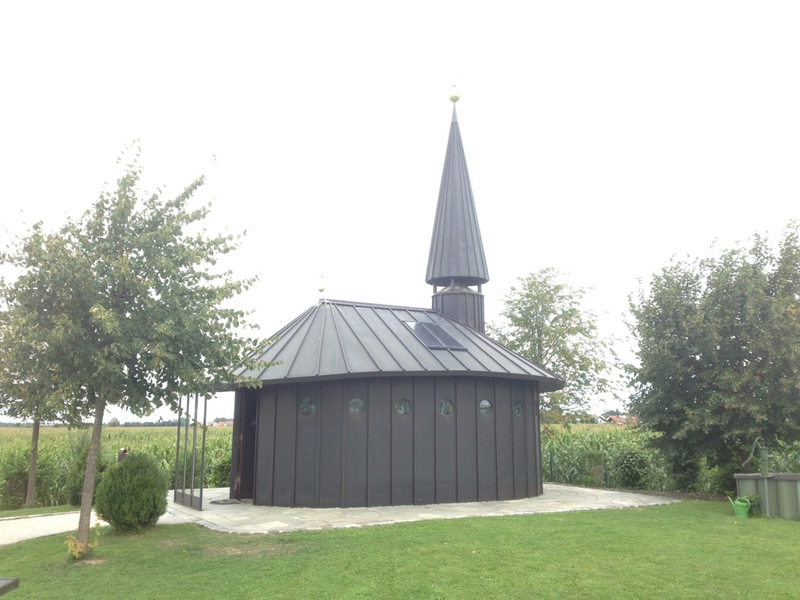 It’s the Pittriching Assisi-Kapelle which was built in 2005-6. 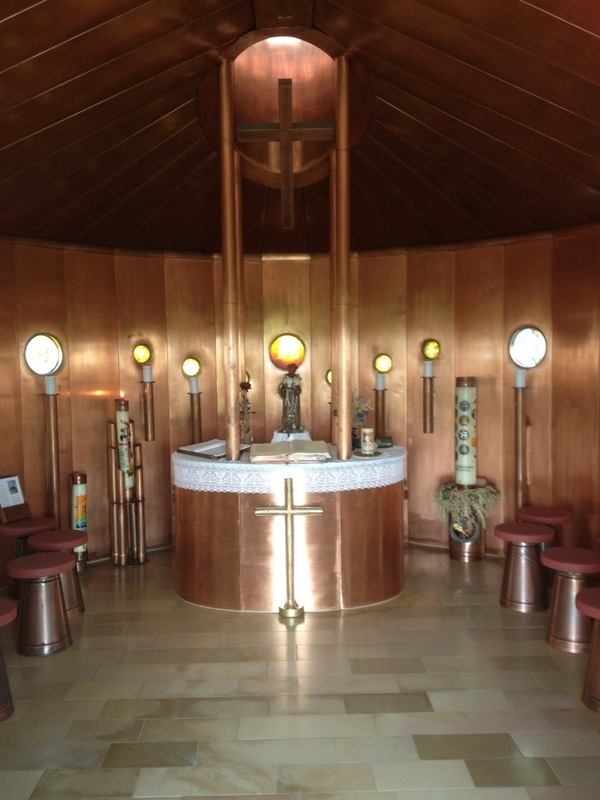 Inside it was fairly simple but very attractive with copper-painted walls etc. 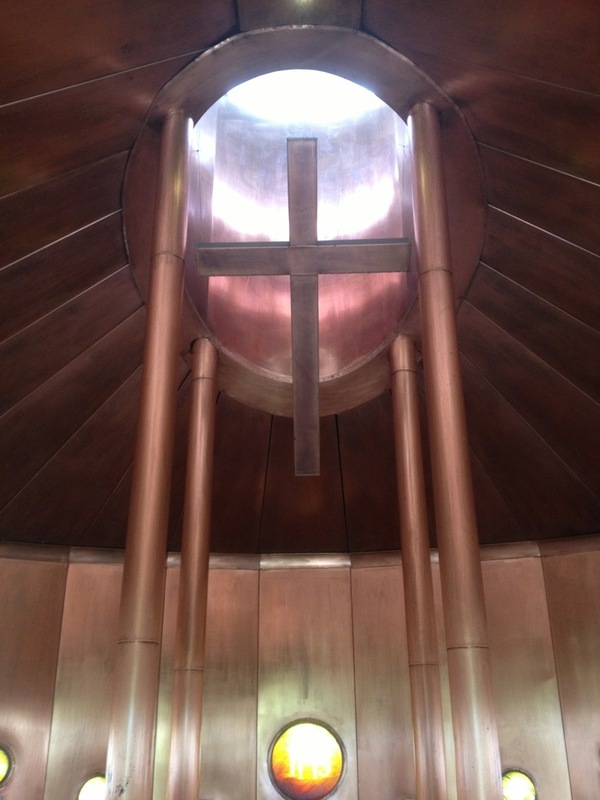 This is the roof skylight. Here are our bikes waiting outside! Note the field of sweetcorn behind Alfie – today we have seen mostly sweetcorn and cattle forage being grown, with grass as well of course. We rode into Pittriching and did a bit of cycling around in search of an ice cream or cake but failed again, which was a bit of a surprise (after all, this is Germany where Eiscafés are everywhere). Still, we only had about six and a half miles to go to our hotel so decided to press on and see if we could find something when we got there. The cycle track was lovely and straight and fast. 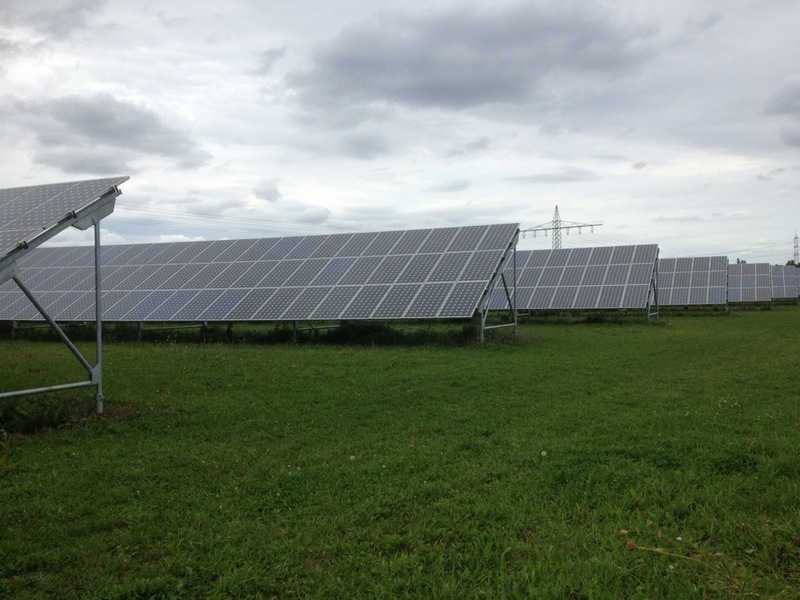 At one point it took us past a solar farm, of which we have seen dozens already in Germany. These are huge – my pictures don’t really do it justice! 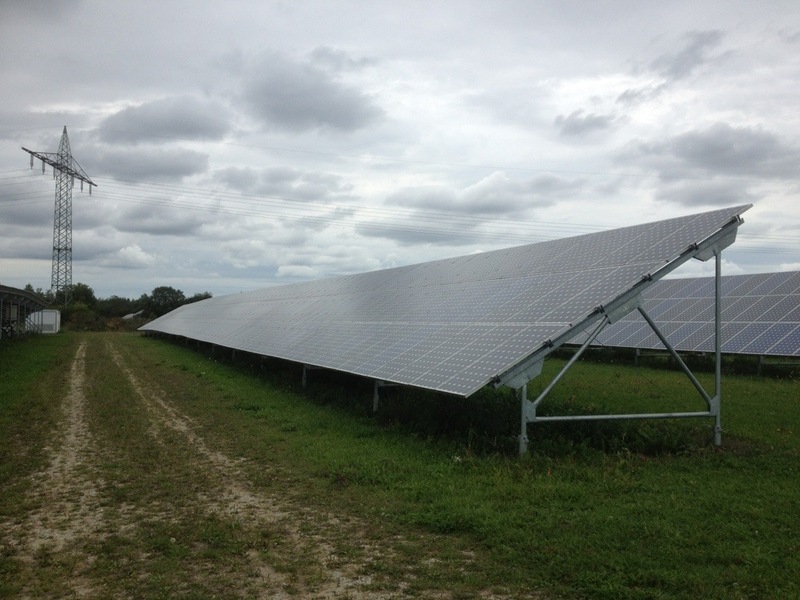 According to a plaque outside the farm, this was built in 2007 and provides 3,318 megawatts peak [EDIT: this was a typo, I failed to remember that Germans use full stop for thousands separator, comma for decimal, so this was actually just over 3 megawatts or 3318 kilowatts] which apparently provides electricity for 1,389 households per year. 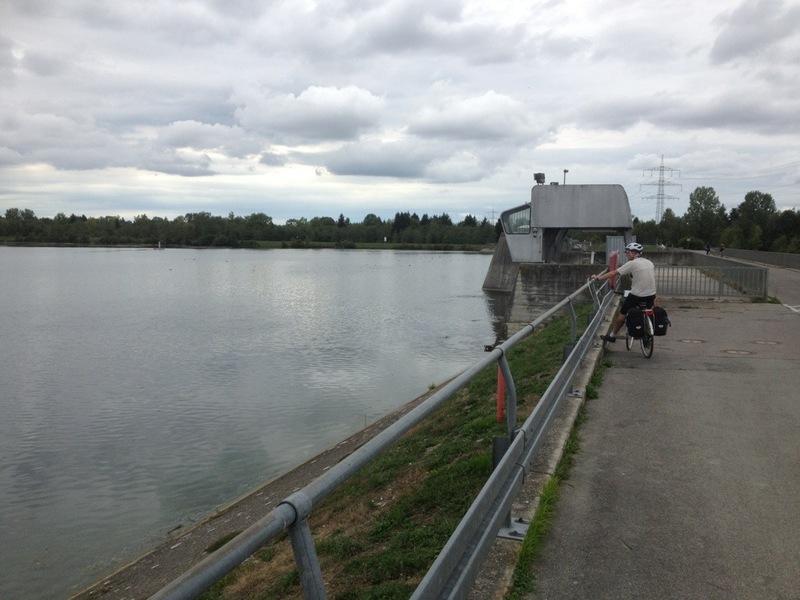 We saw yet another hydroelectric plant (we cycled past at least four today and there were several others where our route was away from the river). 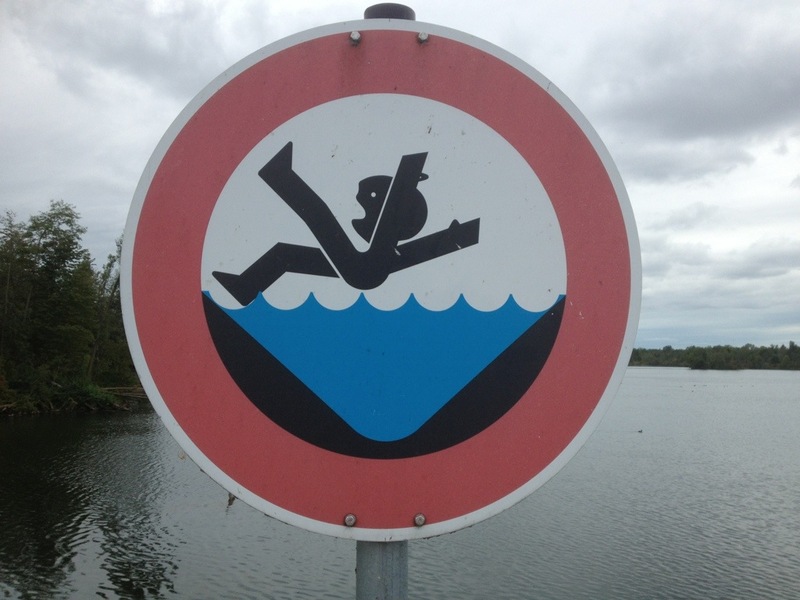 This little sign was at all of them – I think it’s great as the chap’s expression is so funny! 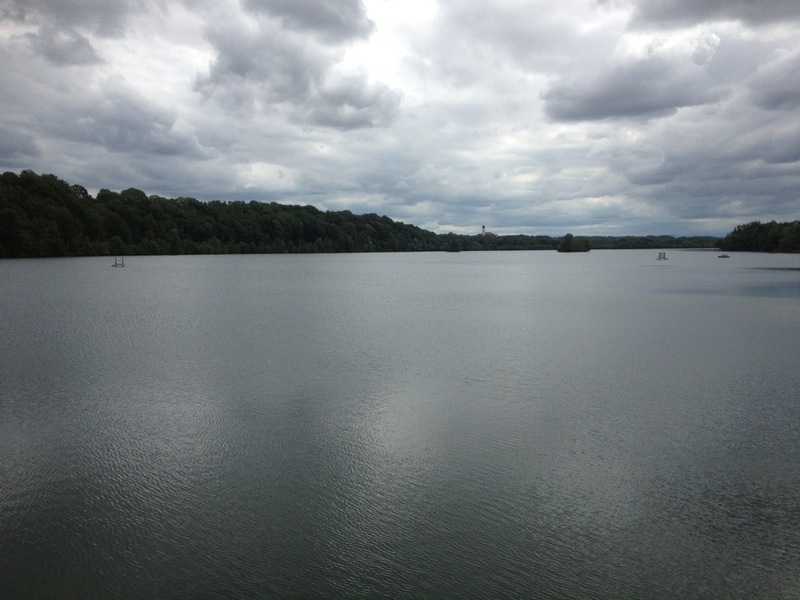 We cycled right over the top of the dam, stopping at the top to take a look. 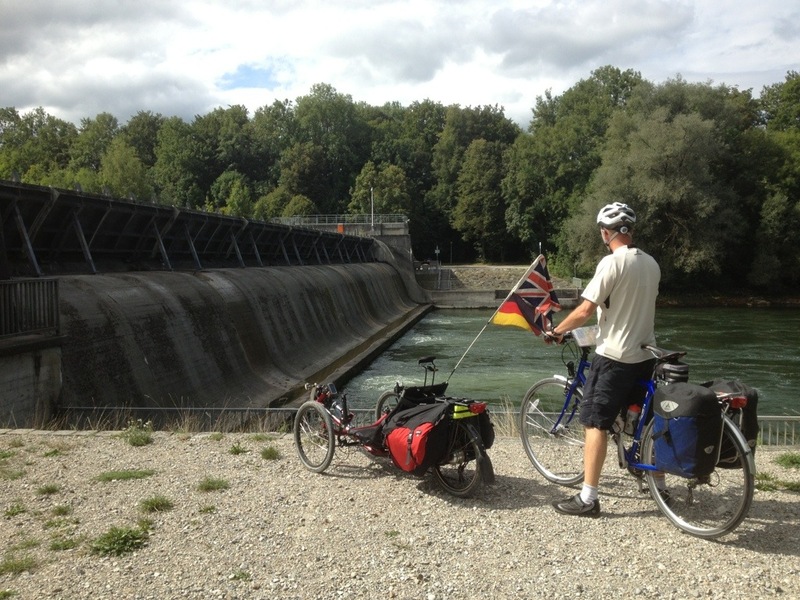 We then had a long, swooping ride down the other side of the dam and then turned onto a crushed gravel path which ran beside a fast-flowing stream, that we think is a bypass stream for the Lech (perhaps to feed the canoeing area which is further downstream than we reached today). This stream had rapids periodically along it but also very low bridges so wouldn’t be navigable for canoes. We ran alongside this stream for about two miles and then the stream flowed into the Mandichosee. 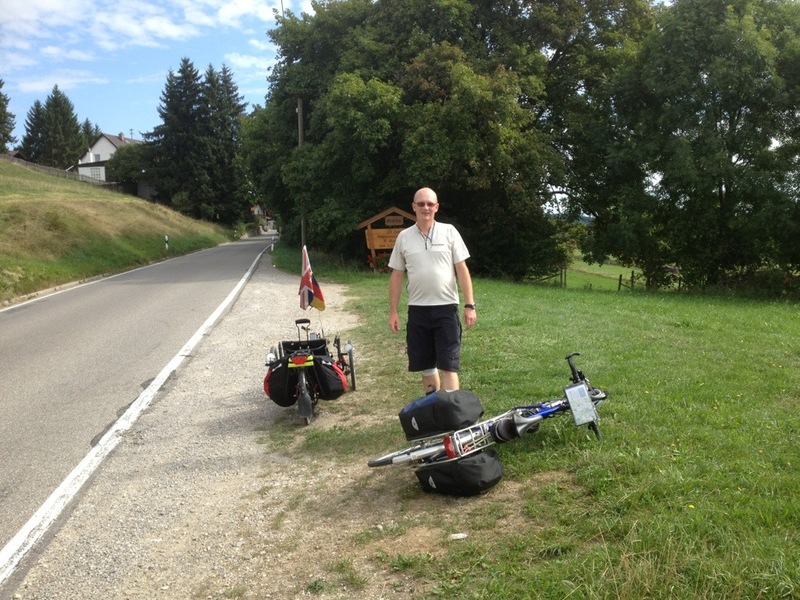 Unfortunately here the track surface became rather unsuitable for three wheelers but I persevered! 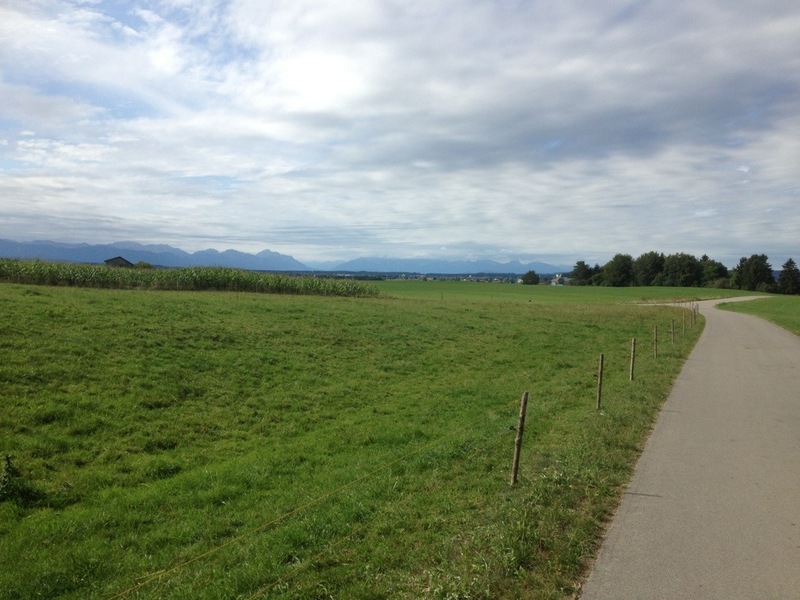 The official cycle route carried on north here but our hotel in Königsbrunn was off to the west so we turned left and followed my Garmin GPS the two miles to the Besthotel Zeller. We arrived and were met by the hotel manager (who seemed to just be standing outside as we got there). He had a little chat with us whilst we sorted out our luggage. I meant to mention previously that I have been using my Radical Banana Bags again for this tour. My last tour with them wasn’t 100% successful but experience always helps and this time round I had bought some waterproof stuff sacks, one for each side, to keep the contents dry if it rains. 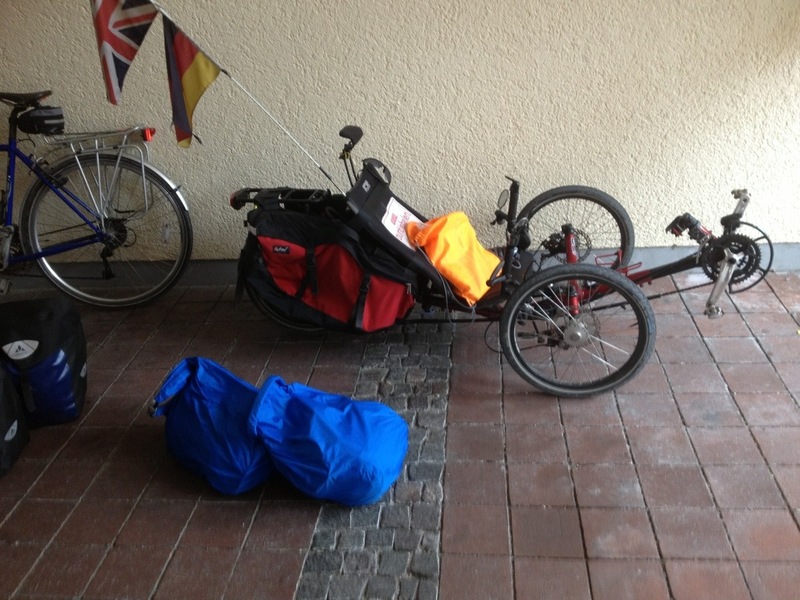 It also means that I can actually leave the Banana Bags fixed to the bike, I just have to remove the blue dry bags. The fluorescent orange bag is a light rucksack that contains all my important stuff; I am happy to leave the other bags on the bike when we stop for cake during the day as there’s nothing of great value in them. After we put our luggage in our room we decided we needed the long-awaited ice cream. Conveniently there was an Eiscafé directly across the road so we headed there. Outside the Eiscafé is this interesting marker post sign. James had three scoops of home-made ice cream (cookies, hazlenut and vanilla). 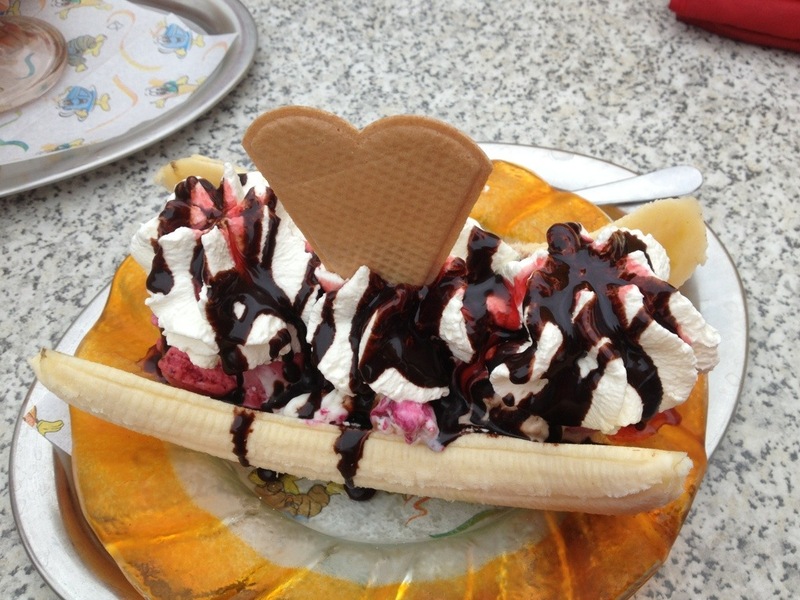 And I had a Banana split. It was not particularly like the illustration/description in the book as it had blackberry ice cream and raspberry ripple ice cream (and hazlenut) rather than the expected Vanilla and Chocolate. 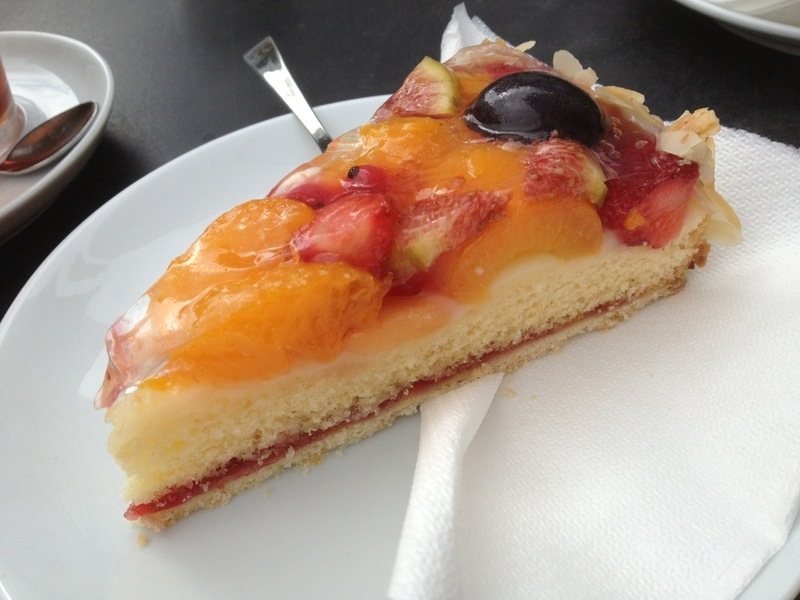 Still, it filled a hole – and the fruit helped towards my 5-a-day! 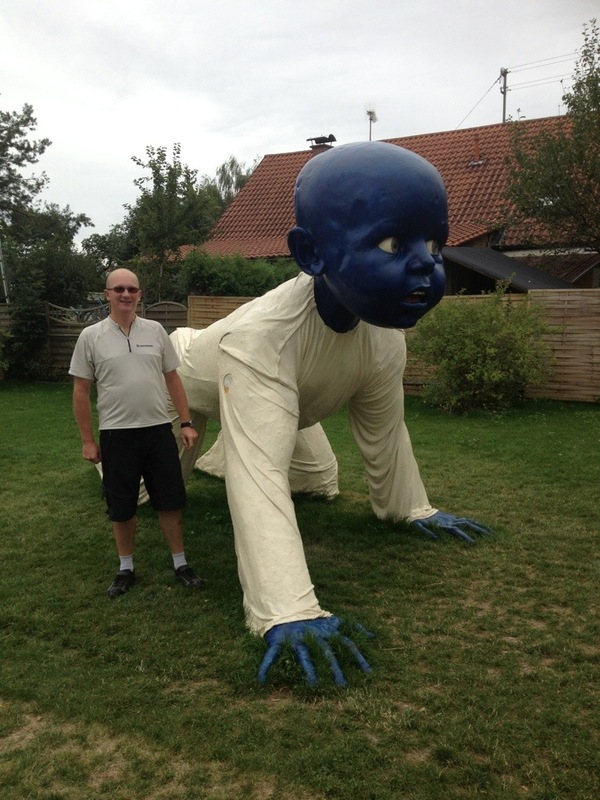 We went for a little walkaround afterwards and came across this most perturbing sculpture. It’s enormous – James barely reaches his chin! There’s also a pink-headed girl. I didn’t like these at all! After writing up some of this blog it was time for dinner. True to form the rain had started at exactly 5pm (James heard the pips on Radio 4) and so we thought we’d eat in the hotel’s restaurant to save getting wet. We had remained entirely dry on our cycle ride today which was a bonus. 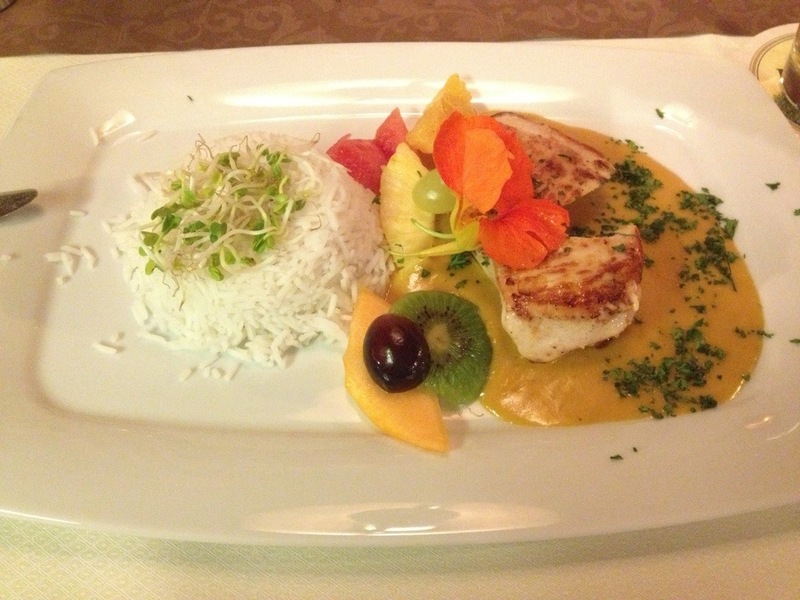 The hotel’s restaurant turned out to be very nice indeed. James had a beer (of course)! 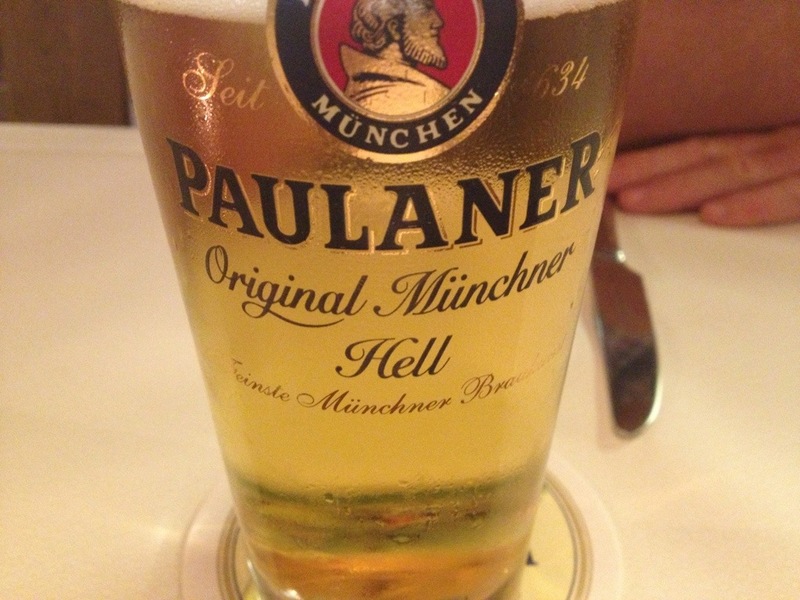 I like the way it says “Original Münchner Hell” which isn’t exactly enticing! 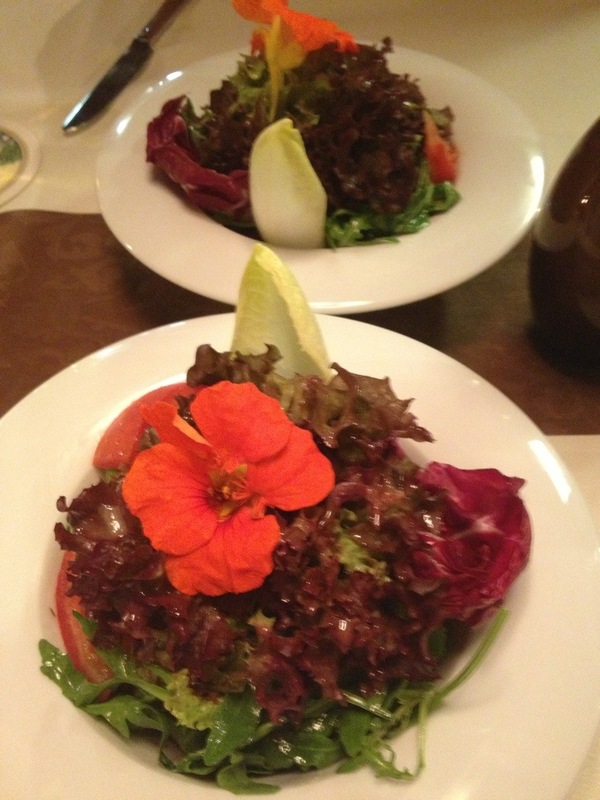 We had a starter of rather attractive salads. 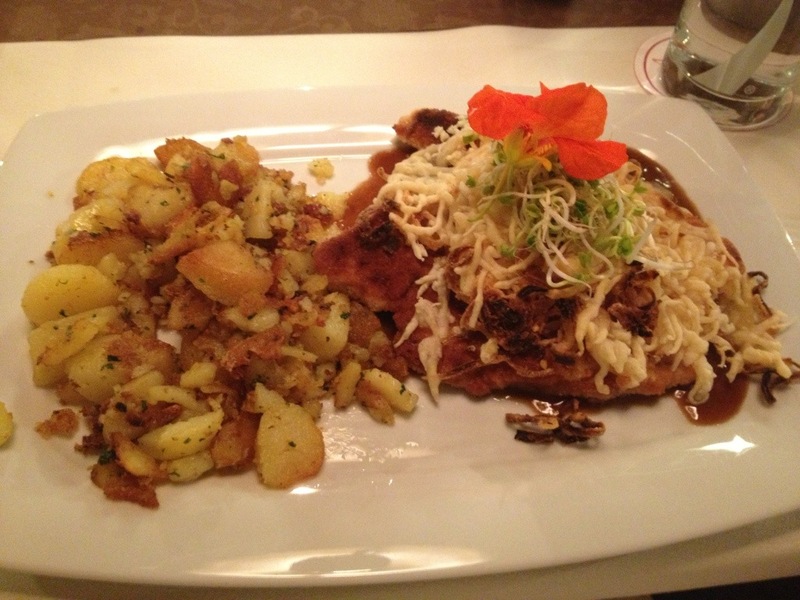 I had a special Schnitzel with cheese. We enjoyed our meal very much and the holiday is clearly successful as my trousers are already feeling tight! 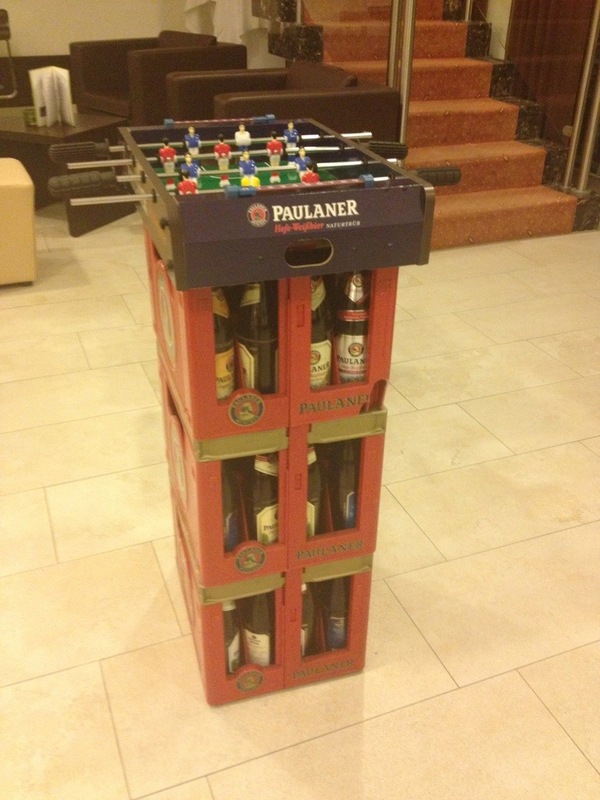 Walking back to our room we passed this Table Football game on top of some beer crates. 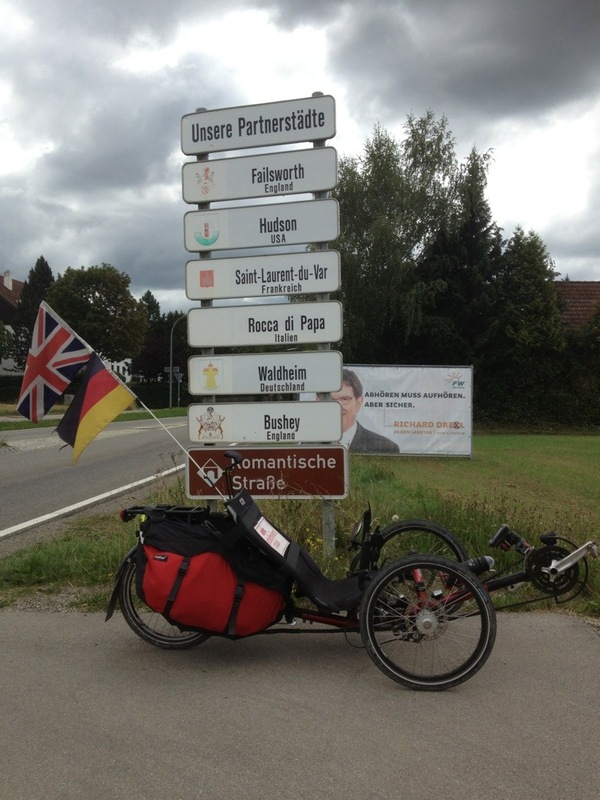 Tomorrow is a shorter day, just under 36 miles, to Meitingen. 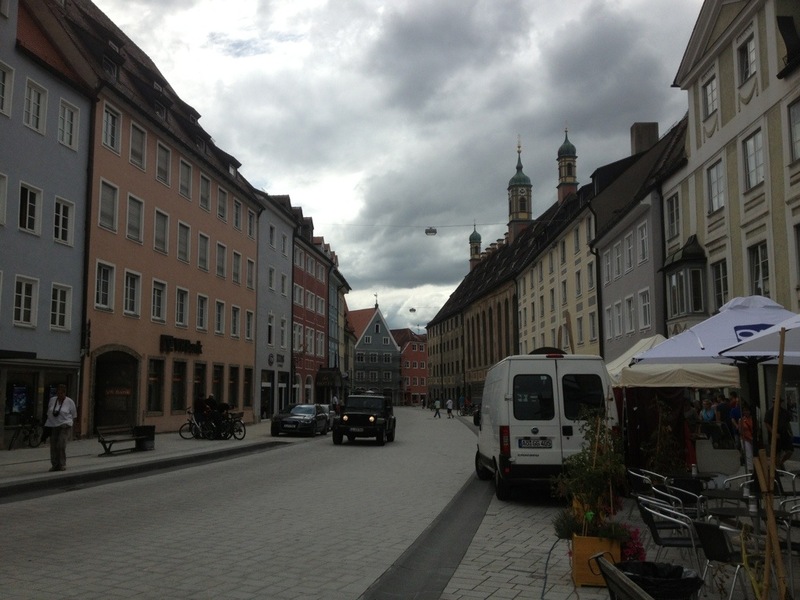 We’ll go through Friedberg and Augsburg on the way, both of which are fairly signficant towns on the Romantic Road. We also have the option of a short detour to the village of Kissing; with a name like that it might have to be visited on this tour! The forecast is for drizzle tomorrow and much colder temperatures, probably only 16-18 degrees all day. I have fished out my windproof jacket which will hopefully be enough to keep the worst of the rain out. 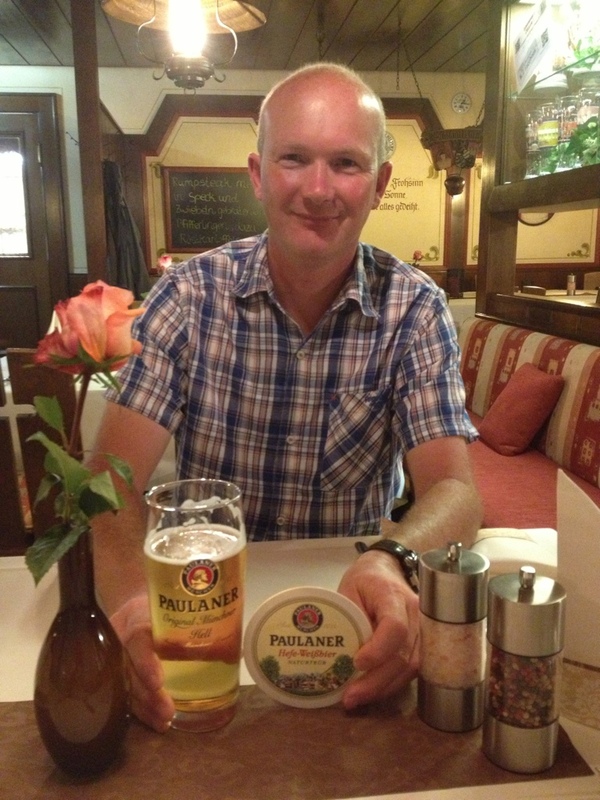 Tomorrow we also meet up with Melanie and Konrad which will be great. The rain is drumming on the windows of the hotel room so we are clearly doing the right thing by hiding in our room rather than exploring Königsbrunn by night. Great writeup as usual Helen. Looks like you’re having a good trip and well done on dodging the showers today. 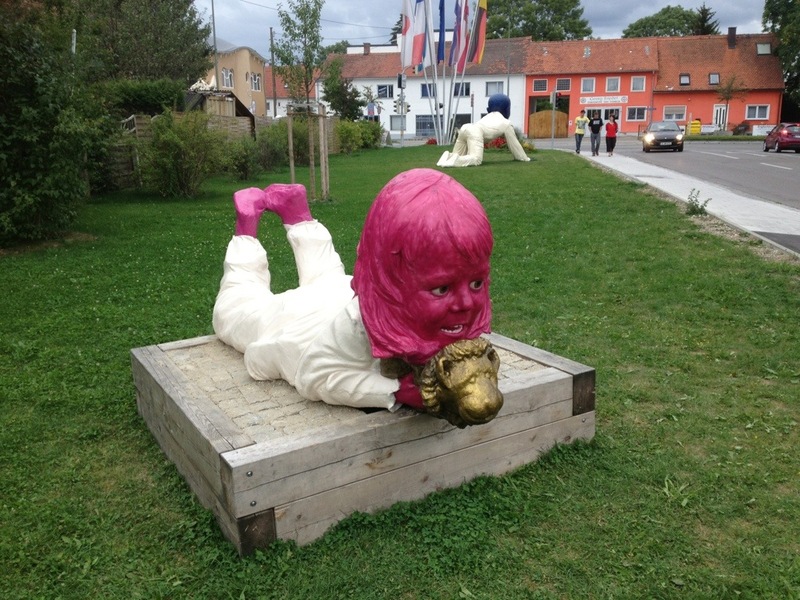 Didn’t like the look of those sculptures either, they look creepy! You can spot it easily on google maps, it’s that big. Yes, that’s the place! I took a photo of the info board about it but obviously misread the statistics! 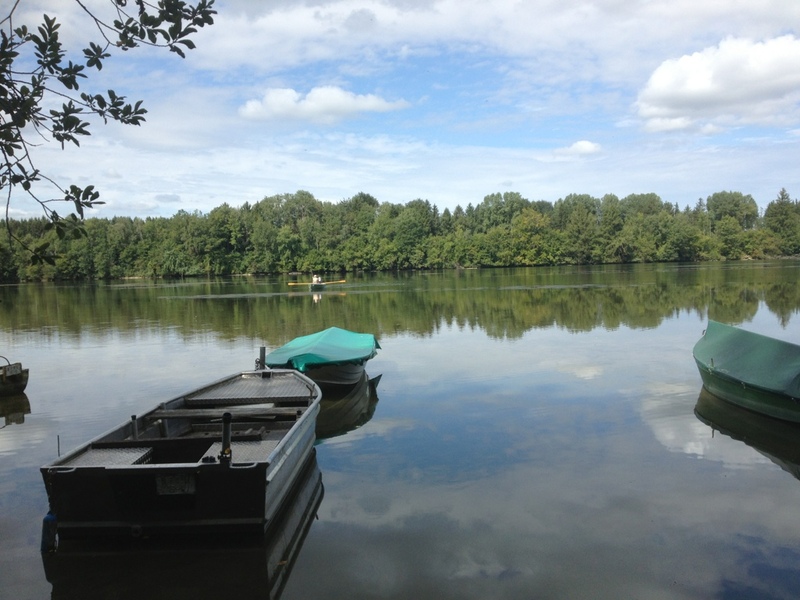 I have added the pic I took to the bottom of the blog – the explanation is all in German, of course!